*Werbung/Ad: It is no secret that I am a huge fan of Louis Vuitton and therefor a real #VuittonGirl. I love their unique pieces and the way they combine innovation with style. Louis Vuitton is always aiming for finest quality and craftsmanship and I constantly fall in love with their collections from season to season. In 2016 Louis Vuitton started diving into a new creative territory. The territory of fragrances. The French brand released seven singular fragrances, each of them precisely composed and crafted at Les Fontaines Parfumées in Grasse, the world’s capital of finest perfume. These seven perfumes are all different, yet united in their extremely feminine and floral notes. Les Fontaines Parfumées is home to creative Jacques Cavallier Belletrud, the brand’s Master Perfumer. Grasse is the nicest smelling city in the world and the most famous place for perfume. From small family owned companies to worldwide known factories, they are all operating in Grasse. Jacques Cavallier Belletrud was originally born and raised in here. His father and grandfather also worked as perfumers. Belletrud therefore carries on traditions in third generation. His parents have always trained and influenced him as a child to build up a strong and intimate connection with all the different components and ingredients of a scent. Belletrud´s mother used to always put a fresh rose next to his bed in the morning. This ritual helped him to learn and memorize the different scents. He wasn’t even ten when he started working at a small factory in Grasse. 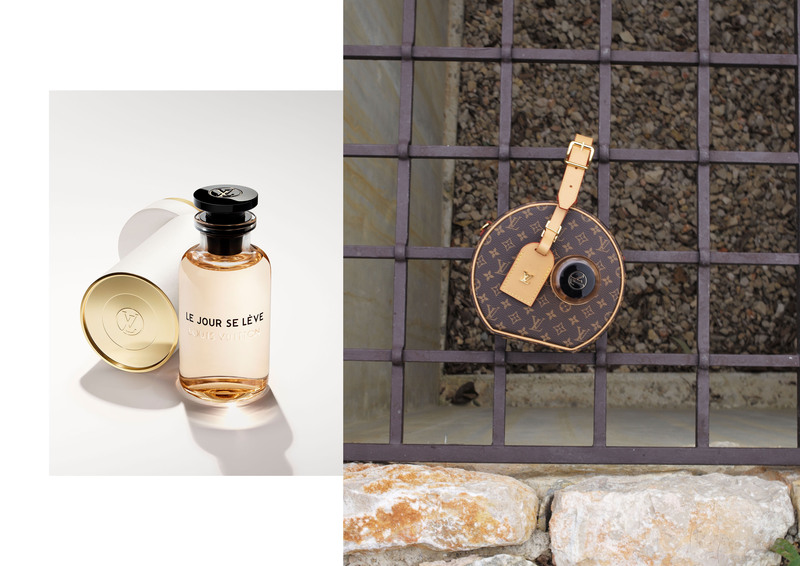 After two years now, Louis Vuitton is ready to introduce their eight scent ‚Le Jour Se Lève‘. For that reason the French brand gave me the exclusive opportunity to visit Les Fontaines Parfumées and get a first glimpse at the new creation. I was super happy to travel to Grasse and experience this unforgettable journey of scents. Les Fontaines Parfumées is a huge estate, situated in the heart of Grasse. It is surrounded by beautiful fields of jasmine and wild gardens. Citrus trees meet different species of mint and roses. The whole atmosphere is unbelievable. While strolling in the garden, you experience all the different scents of the local plants and trees. A special atmosphere that influences the quality of the perfumes,that are being composed her. I had a wonderful time and I am very thankful I got this great and very privat opportunity. I loved visiting the creative atelier and spent time with Louis Vuitton and a small intimate group of girls. Le Jour Se Lève is inspired by the freshness of daybreak, morning’s first rays and raw light, conserving the optimism of the new day. Jacques Cavallier Belletrud wanted to capture this miraculous energy and endless possibilities the sun sets free in the morning.It was inspired by the light of the sun. The new fragrance is composed of mandarine, jasmine sambac, magnolia, apricot-tinged osmanthus and subtle notes of tangy blackcurrant and musk. Le Jour Se Lève is a fruity fresh and floral fragrance. The crispy notes of mandarine stand for optimism and freshness, musk adds warmth to the fragrance, just like the first rays of sun in the morning that begin to warm the skin. Le Jour Se Lève is presented in the same iconic bottle as the other collection of Louis Vuitton perfumes. They are all designed to be kept and you can always have them refilled at a Louis Vuitton store. I really love their classic, yet outstanding design. The new fragrance will be available on 15th March at selected Louis Vuitton stores and at louisvuitton.com. The launch also comes along with a luxury travel bottle and travel sets. I shot this new video for you to capture the beautiful and magic energy of Les Fontaines Parfumées. What do you guys think?